The microarray scanner is a sophisticated laser- induced fluorescence scanner designed to read microarrays printed on standard 1 x 3" (25 mm x 75 mm) glass slides. 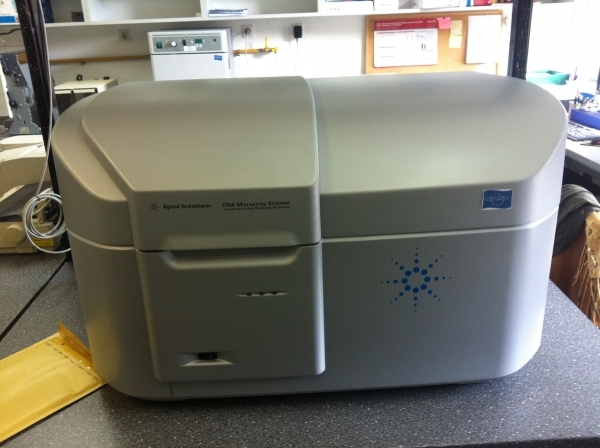 The microarray scanner measures the fluorescence intensity of labeled sample nucleic acid (DNA and RNA), and protein bound to microarrays. Its ability to measure fluorescence from two dyes simultaneously facilitates all two- color microarray studies. This technology provides for rapid, high- quality, automated scanning of microarrays.